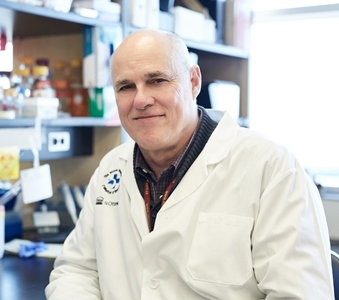 “Duchenne muscular dystrophy is complex, and we will probably need a combination of treatments to address all aspects of the disease,” said Dr. Rudnicki. 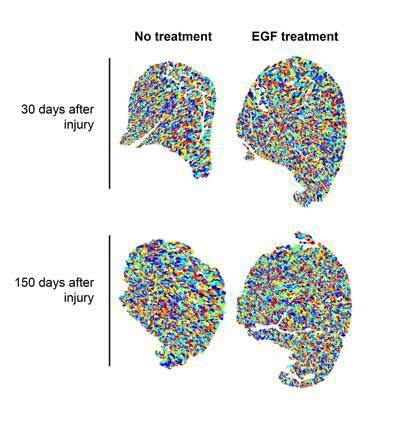 EGF treatment enhances muscle repair after injury in a mouse model of Duchenne muscular dystrophy. Colour represents individual muscle fibers in muscle cross sections. Image courtesy of Cell Stem Cell. Acknowledgements: This research was possible because of generous donations to The Ottawa Hospital for regenerative medicine research. This research was also funded by the US National Institutes for Health, the Canadian Institutes for Health Research, Muscular Dystrophy Canada, the Muscular Dystrophy Association, the Ontario Institute for Regenerative Medicine, and the Stem Cell Network. It was also supported by StemCore Laboratories. Dr. Rudnicki is a founder of Satellos Bioscience Inc., a company that is advancing this research. Full Reference: EGFR-Aurka Signaling Rescues Polarity and Regeneration Defects in Dystrophin-Deficient Muscle Stem Cells by Increasing Asymmetric Divisions. Yu Xin Wang, Peter Feige, Caroline E. Brun, Bahareh Hekmatnejad, Nicolas A.Dumont, Jean-Marc Renaud, Sharlene Faulkes, Dan Guindon, and Michael A. Rudnicki. Cell Stem Cell. January 31, 2019.